Here are a couple of smaller soft pastel paintings I accomplished this past winter. I love the desert sunsets! The originals are so much brighter than the digital camera can capture. More to come. NEW! Launch of Zazzle Store-Gurupainter! A new painting fresh off the easle. This is an 11" x 14" pastel painting titled Hummingbird 1. The first of a series planned for the winter of 2009-2010. I used creative liscence for the coloration, but it is roughly based on a broad-bill species. 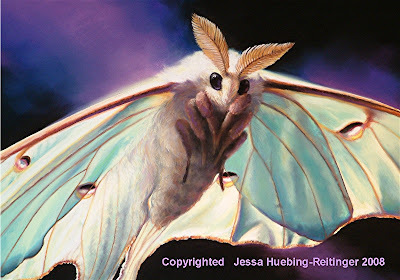 I used mostly Sennelier soft pastels on Wallis Museum pastel paper, which gave way to brilliant colors, and of course some alterations to the natural colors of the bird. Let me know your thoughts, I've got 9 more scheduled to come.......fun, fun, fun! 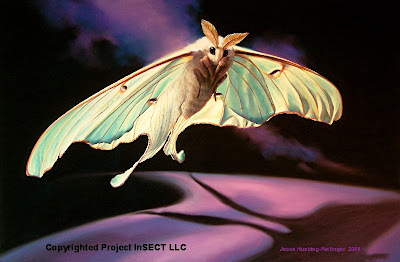 Here is another Project InSECT flashback. Pictured above is a finished image of "Napoleon" the leaf footed bug on a passion flower 2006. This extravagant insect is found in Brazil and is so called "leaf footed" due to the "bell bottom" style back legs. The finished pastel painting is 16" x 20" on Wallis Museum Paper. (The best pastel paper in the world by the way:) I normally do not paint flowers and such in the backgrounds of the insects, but have from time to time taken on the challenge of leaves and flower petals. Above is the detail of the study painting, the light on this one was fun, and the polar bear like hair on his head and body make him so lovable and cute. It is the way the speciman looked under the microscope. I think fuzzy wuzzy was a moth! 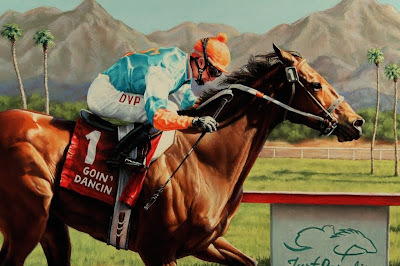 Here is the long awaited finished pastel portrait of Goin' Dancin, a racehorse owned by Lanham Racing. 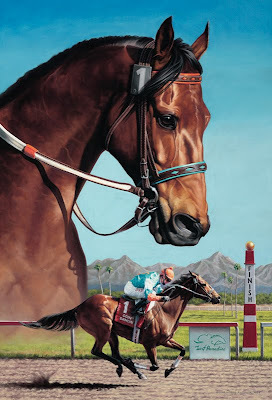 The portrait size is 24" x 36" and was very challenging once I got to the bottom portion with the horse and jockey crossing the finish line. My hubz made a funny comment as I finished up the piece, he said, "I think this is the first painting you have done where you actually got to paint a finish line at the finish line." The full picture above was digitally photographed by Photographic Works here in Tucson today. They did a fantastic job. Below are 2 detail pics of the horse and jockey that I took with my little camera at the easle......enjoy! 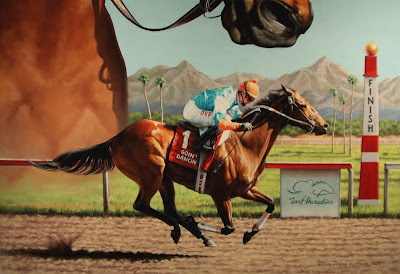 Goin Dancin is pictured here winning a stakes race at Turf Paradise located in Phoenix, AZ. I was able to meet the horse in person and photograph him a few times on and off the track which really helped me capture his expression and personality. The jockey and horses chest were very challenging as the detail was quite intense in these areas. The jockeys head is no bigger than a quarter to give you an idea of size.